Rufus Coates and the Blackened Trees play the launch of their self-titled debut album at Avenue by Nick Munier on Crow Street in Dublin on 16 April. This release, like Rufus’ voice, goes for the gut; that is, it’s honest and direct. The album’s main characteristic is the warm enclosing vortex created by the vocal helices, revolving around sometimes big pointy blues riffs and sometimes blankety bluegrass chord progressions with folksy stylings. The themes of this lyrically poesy album include time – its passage in particular – depression and loneliness, nature, free will, life and death, deeds and consequence. I could go on. The second track, ‘Every Time You’ll See’, stomps through the woods in behind John Fahey’s gaff to meet up with a really lovely Manzarek-y sounding organ. As in opener ‘Here All Day,’ the vocal lines punch out the melody inferred by the chord progression and organ notes before the insistent guitar riff takes over. Much of the lyrical tone on the release comes from that great old twelve-bar stance – the parable, the warning, the ‘let me tell you something’ of Son House and Charlie Patton’s wrecked-up blues. Occupying the prestigious Track 3 slot on this album is ‘Safe for Now’, reminiscent in style of something from Tom Waits’ Rain Dogs and enjoying a mysterious little wandering bridge that is one of the highlights of the LP. Drawing out the Waits comparison, Coates and his Trees seem similarly open to letting varied influences into their songwriting – influences that others might keep at bay. They don’t seem to be afraid of playfulness, despite the general melancholic attitude of the album’s content. The album is not overtly sad or pessimistic: it’s rather that its darkness is expressed so well at the crucial points, i.e., with regards to individual tracks. What does light represent in these terms? Melancholy is here apparently a distortion or corruption of light brought about by a ‘storm’, the classic mirror of inclement weather to an inclement state of mind reveals a self-awareness, positioned somewhere along the road between the recognition of and the conquering of such a ‘storm’. To shed light on something always involves appreciating its true and honest form, being no longer deceived by its appearance in half-light, its shadows. In ‘Footpaths of Shame’ which deals with depression, loneliness in particular, the lightness of Summer offers a realisation about Winter and the experiences its darkness brings. ‘Autumn Leaves’ comprises of the vocals of Jess Smith together with really a clever conversation between two guitars and gives off the feeling of a track from Nick Cave’s Murder Ballads with its unconcerned empty bar piano and clopping, far-off snare hits. It comes in just before ‘Up Up And Away’ which I feel is the most unique song on here in relation to its siblings, in which a Jack Johnson-style guitar feeds into a rumination about death and what follows. I’d like to close saying something about ‘Not That Easy,’ an absolute stormer of a track, second-to-last on the album and I dare say perhaps the real Track 3. For most of the listen the voices of both Rufus and Jess are cradled in an area between reserved and tempestuous. Feeding off the requisite emotional density on this track however they find homes, two voices so well paired throughout. Jess in pulls off some seriously refreshing and necessary roaring. It’s as though her voice is finally loosed upon the listener who, innocently, hadn’t realised they had been waiting for it. Listening to this debut LP from the Irish five-piece brings to mind what is most enjoyable about music for me: being transported by sound, being suggested to by style and being impressed by complexity. It’s impossible to choose one representative song from this release so I’ll have to go with recommending ‘Menacing Form’ with its beautiful organ sounds feeling around in negative space, a track which I believe well exhibits their potential both within a song and in terms of future releases, which I’m really looking forward to. 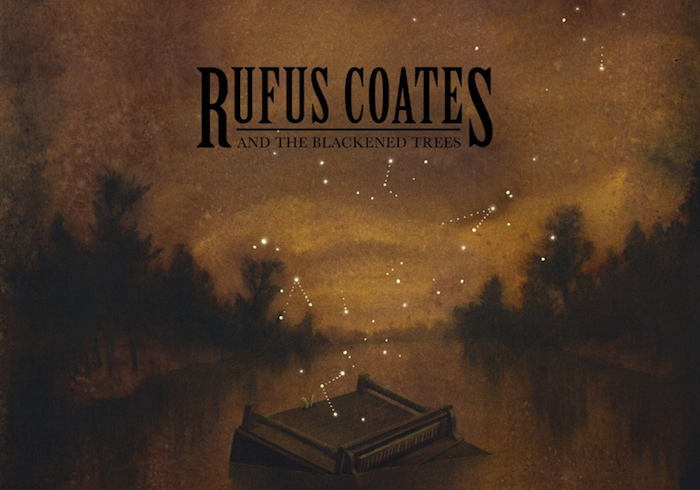 Rufus Coates & the Blackened Trees’ self-titled album is released on 16 April.